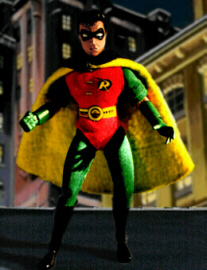 Robin is a 7" Mego Lion Rock Figure body with newly sculpted head. New hands and feet were added with painted leather gauntlets to simulate his gloves and boots. The costume is hand stitched and the decals on his costume were actually cut from the cover of a Robin comic book and applied with glue. 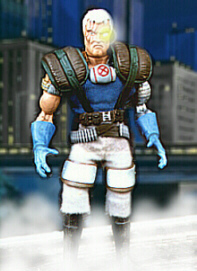 Taking a ToyBiz Pheonix body and adding an Invisible Woman's head I created one of DC comics characters that have been neglegted in the action figure market for a long time. The cape was taken from a Superman Steel figure and was altered through the use of Super Sculpey. Taking a 8" Star Trek Mego body I resculpted the upper half and added a new head. After I gave him new hands and plastic gauntlets to simulate gloves, the rest of the costume was rather simple. 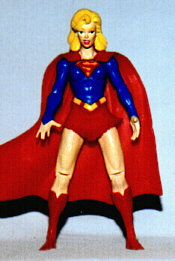 The shoulder pads were sculpted with Super Sculpey and the belt was from a Mego Lion Rock figure. Other details were added using scrap plastic. Made from a ToyBiz 10" Ghost Rider Figure with extra leather skirt to complete the trenchcoat while extra details were added with Sculpey. 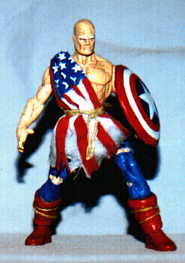 This is one of two figures that I had sent in to Wizard's Homemade Heroes contest (the other being Captain America). The first Published Picture was of Capt. America almost two months after I sent the pictures to them. One year later....ToyFare issue 1 hits the shelves and inside was my Red Skull. I had almost given up hope, but sure enough, there he was. Recently, Wizard had a preview of Earth X, a new comic mini-series much like DC's Kingdom Come. 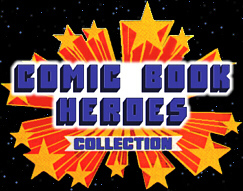 Although they specified that this still may not become a comic book, I had been inspired by the sketches done by Alex Ross. So much so that I created this figure of Capt. America. The base figure is a Total Justice Green Lantern with the limbs from the Hawkman figure. The head is from a ToyBiz Forearm while other details are made of Sculpey. With a piece of white cloth painted like the flag and a custom shield made from the bottom of a pop can, this figure is complete. Cool, Huh!